Clive. And, for the kids, a very naughty Bunnicula. As a film actor, Ethan Hawke has never much excited me, and I’ll take it on faith that I wouldn’t much care for his novels or self-directed indie movies, either. But a guy who works as hard as he does is bound to find his niche, and so Hawke has, as a New York stage actor and director. Part of it, I think, is good taste in material–I may not care for all of his movies, but there’s not a lot of obvious paycheck crap on his resume, and he has received two Oscar nominations, for performing (Training Day) and screenwriting (Before Sunset, part of his now three-film “franchise,” and rather Off Broadway in nature). He’s entirely respectable, which is no small thing. And, on and off Broadway, more than that. A surprisingly dab hand at Shakespeare in Henry IV on Broadway ten years ago, the first time I saw him onstage. (He had played Hamlet in a quirky modern-dress movie in 2000.) 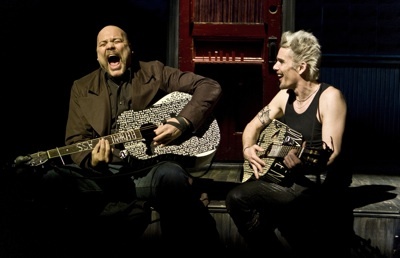 As good as the rest of a great cast in a scorching Off Broadway revival of Hurlyburly in 2005. Better than that–indeed, stealing scenes, something I never thought possible for him to do–in Tom Stoppard’s three-part epic The Coast of Utopia, a well-earned Tony nomination in 2007. Sam Mendes’ cross-continental Bridge Project cast him in The Cherry Orchard and The Winter’s Tale, which I enjoyed at the Brooklyn Academy of Music. For The New Group, which resides Off Broadway at Theatre Row and produced Hurlyburly, Hawke directed two plays, Jonathan Marc Sherman’s affecting alcoholism comedy-drama Things We Want (2007), and an outstanding revival of Sam Shepard’s A Lie of the Mind in 2010. Hot on the heels of starring in Ivanov at Classic Stage Company, Hawke has returned as actor-director to The New Group with Sherman’s Clive–and fallen flat on his face. A loose adaptation of Bertolt Brecht’s first full-length play, Baal, it tells the story, “in 21 shards” per the advertising, of Clive, a drunk, coke-snorting rocker in 90s Manhattan, and the innocents, users, and abusers who tumble in and out of his rapidly dead-ending life. With electric-blonde hair, leather regalia, and a guitar he plinks out a few tunes on, Hawke is Clive, and he gives the part his collapsing all. As they bark out their stage directions in a Brechtian way, everyone tries, including a bellowing, bald-pated Vincent D’Onofrio, as Clive’s partner in questionable behavior, Doc (a Hunter S. Thompson allusion, perhaps? ), Off Broadway “It” girl Zoe Kazan as two of the women who flop into bed with him, and all-purpose comic Brooks Ashmanskas as a handful of scuzzballs (and a priest). But Hawke, the director, gives us nothing, as various salacious, misogynistic activities occur under Jeff Croiter’s slashing lights on Derek McLane’s beer-canned, spangly, dangling set, which in outline could be the evil twin of his Oscar effort. Objectionable, yes, yet also oddly chaste, as if a natural propriety means he can’t bring himself to go all the way with the gamy material. Watching Clive is like coming across an edited-for-content counterculture movie from the early 70s, and wondering what all the fuss was about. Critic John Simon once wrote that the indisputable right of the artist is the right to fail. And so Hawke, in trying to go beyond Chekhov or Shepard and the bounds of realism, has failed. His and Sherman’s brand of Brechtian alienation is just alienating, sleep-inducing. (And a reminder that an intermissionless show is one you can’t easily escape from, as you can from one with the exit hatch of an interval.) Now that he’s gotten Clive out of his system, better is to come. I’ve seen more children’s theatre as an adult than I ever saw as a child. Of late my viewing’s taken a twist, in that I’m now taking my four-year-old daughter. We got off to a slow start. At a Christmas-themed show that was geared for older kids, one of the actors, trying to direct Santa and his reindeer, repeated, “Where do you want to go? Where do you want to go?” To which Larissa shouted, “I want to go home!” Everyone’s a critic. We are improving. Last November we saw a very fun production of The Velveteen Rabbit, a Brooklyn Center for the Performing Arts presentation at Brooklyn College, part of the Target Storybook Series, which will bring us American Family Theater’s Sleeping Beauty on March 10. Now this is the sort of corporate initiative we can all get behind. Children of all ages had a good time. Last weekend we trekked among the hipsters for Larissa’s first Off Broadway musical, Bunnicula, bunnies being the in animal these days at children’s theatres. 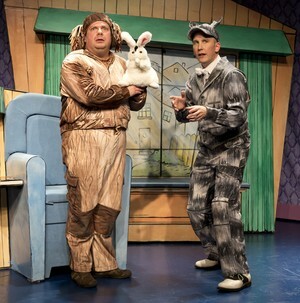 (DR2 Kids Theatre had a Velveteen Rabbit of its own last year, part of its “Rabbit Season.”) Based on a popular series of children’s books that began in 1979, Bunnicula is a harmless rodent accused of some very grave misdeeds by his fellow pets, a suspicious cat, Chester (Prescott Seymour), and a dopey dog, Harold (Robert Anthony Jones). Found at a movie theater showing Dracula, Bunnicula is accused of draining the juice from the vegetables in the family fridge, a crime his preoccupied humans fail to pay much attention to. Many cute and catchy songs later, the rumpus is resolved. Those songs, penned by Mark Waldrop (of the hilarious revue When Pigs Fly, a highlight of my 90s theatregoing), support a book by the great Charles Busch (The Tale of the Allergist’s Wife), which neatly compresses the storyline into one hour. The enjoyable pop-up sets are by Rob Odorisio; the costumes, which fit pets and owners to a T, by Gregory Gale (Bunnicula is a hand puppet). Carl Andress, who directed Busch’s Die, Mommie, Die! and other hits, brings a downtown sensibility to the show that will satisfy grownup fans of these veteran talents, and Seymour and Jones in particular are excellent. Rest assured, parents, that the target audience is not ignored. My daughter and I give Bunnicula four carrots.